As with all Quantum Design instruments, VersaLab is a fully automated turnkey system with a user-friendly interface, and utilizes technology developed for Quantum Design’s popular Physical Property Measurement System (PPMS®). VersaLab is specifically designed for material characterization up to 3 tesla and over a wide temperature range without the need of liquid cryogens. Utilizing a new approach to cryocooler equipment design, VersaLab employs a new 4He-based temperature control system and gas flow technology that eliminates the need for liquid cryogens. 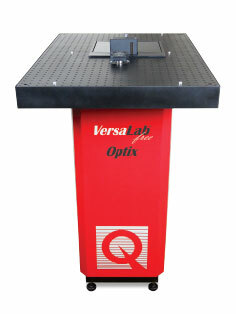 VersaLab Optix is a flexible, modular optical platform that provides "turn-key" measurements and custom built experiments. It is the ideal platform for combining photonics, quantum electronics, optics with electro-transport, and magneto-optic materials characterization measurements at cryogenic temperatures and in magnetic fields of ± 3 T. The optical breadboard allows a wide range of configurable experimental space seamlessly integrated onto the VersaLab. Various light sources, opto-mechanical and imaging components can be easily mounted and coupled to the cryogenic and magnetic field environment of the sample space. By integrating the Optix option onto a VersaLab system, users can perform multiple measurements in a single sweep by combining Quantum Design's existing measurement options with new optical possibilities. 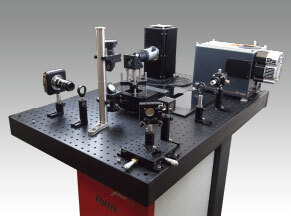 Optional laser light sources (such as Raman or a Xenon Arc lamp) are available for providing the necessary source for excitation beams for optical and spectroscopy experiments. An integrated compact imaging spectrograph and CCD camera controlled directly from the MultiVu system software are also available to automatically collect spectra and sample images as a function of temperature and magnetic field. Quantum Design Education is a website dedicated to the use of the PPMS VersaLab for education and research. This site offers free experimental modules highlighting the measurement options available on this platform. 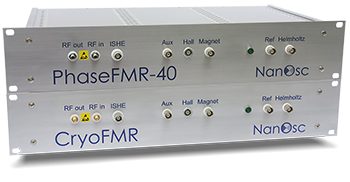 The CryoFMR spectrometer is a plug and play system that allows broadband CPW-FMR characterization with lock-in capability. It includes its own RF frequency source as well as lock-in detection module, so that the only parts required to conduct an experiment are a computer for software control and a PPMS platform. Temperature range: 50 K to 400 K. Frequency Range 2 to 17 GHz.